David Jones has revealed its 2015 Babywear, Nursery & Toys catalogue and it is a dream nursery wishlist extraordinaire for expectant parents, new mums and dads and anyone who has a little one in their life that they would like to spoil. Come take a look and see why we’re so excited! 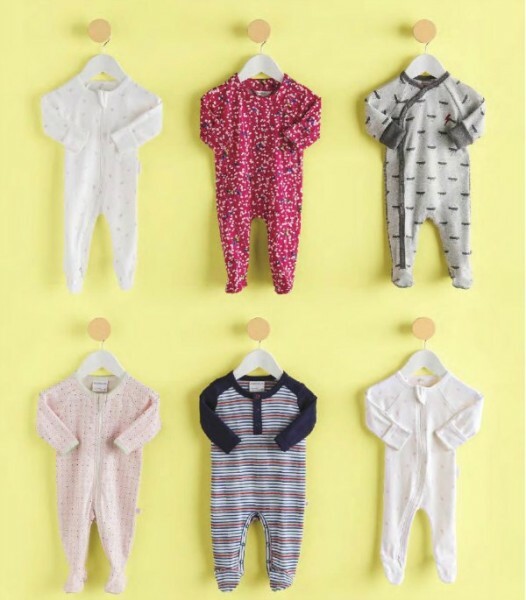 If you’re looking for some nursery, babywear and toy inspiration, whether for a friend’s bub, for your daughter’s bub or for your own bub, then check out our awe-inspiring nursery picks from the David Jones Babywear collection. The adorable bath sets, the clever onesies and the beautiful cot linen are all inspired by elegant textures, pastel colours and a delicate hand crafted feel. The nursery is your baby’s safe zone as well as a place where you can let your imagination run wild. You are free to use any theme, any colour scheme and any furniture that inspires you and the new collections coming to David Jones – like the beautiful linens and bedding up there – will help you on your way. We couldn’t look past this beautiful Urbane By Boori@ ‘Lucia’ Convertible Plus Cot Bed in Almond and matching Three-Drawer Dresser. 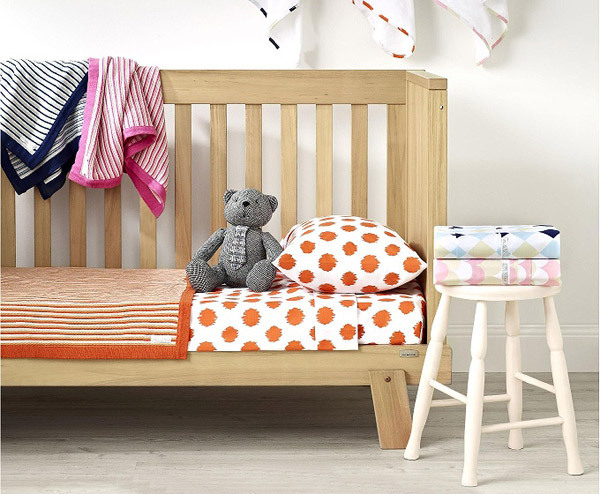 The cot bed and dresser drawer create a bold living space and offer an excellent space saving solution. They also match a number of different colour schemes, from deep reds and nautical blues to light and airy greys, blues and pinks. We love the look of the BABY by David Jones collection of face washers, hooded towels and adorable Bee money bank. Simple, beautiful and practical. 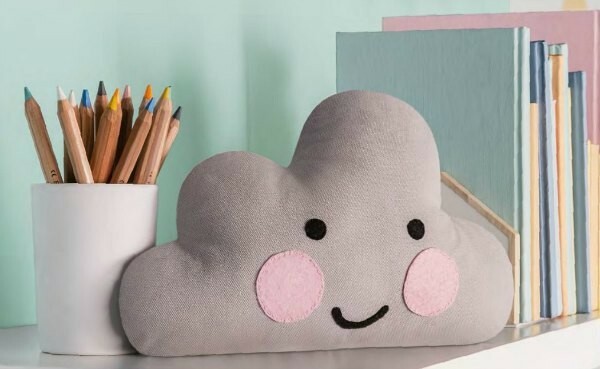 If you are considering a sky theme for your nursery, then give these DIY cloud pillows a try. You can get the free pattern here. 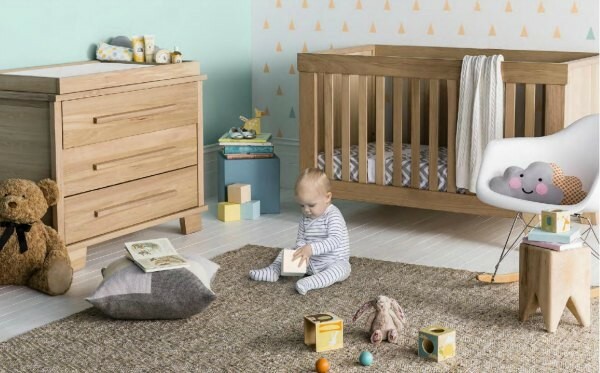 Inspire sweet baby dreams with a beautiful sky-themed mobile, the BABY by David Jones Grey Chevron three piece set and a beautiful textured throw, perfect for those late night cuddles in the rocking chair. Nursery aside, it’s time to dress bub and we really love the vibrant colours featured in the new romper collection. Take your pick with growsuits and rompers from designers like Marquise, Fox & Finch and Purebaby. Not only are these durable but also practical. My children lived in rompers for the first year and these ones are great for daily outings to the shops, the park, mother’s group or a morning stroll. I couldn’t resist ending with these beautiful Bébé by Minihaha@ Christening gowns and party outfits that are guaranteed to raise the bar for cuteness. We just love the handcrafted feel and the unique embroidery and these gowns are perfect for a number of occasions – an upcoming wedding, birthday party or photo shoot. Our top picks? The Lace and Taffeta Dress and the Short-Sleeve Christening Romper with matching soft cap. Check out the new David Jones Babywear, Nursery & Toys collection for inspiration. Pick a few of your favourite items and work from there. Choose colours that match your overall vision and stick to a few statement pieces and bold furniture. And be sure to share with your friends and family members, especially if your baby shower is coming up.